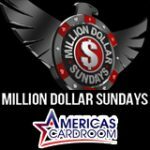 Play for more than $100K in prize pools in the Carbon Poker Mega Stack tournaments taking place this January. 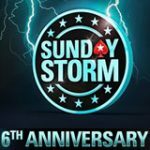 Selected tourneys from the Carbon Poker Sunday Lineup will feature increased prize pools and will run in the Mega stack tournament format. 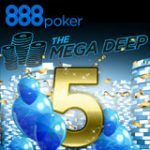 There are five Mega Stack tournaments scheduled for January 18th, but satellite tournaments are running now giving players enough time to win their entry to these events. 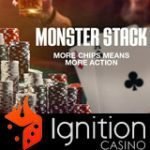 On one special date this January players can take advantage of the Carbon Poker Mega Stack tournaments which feature bigger guaranteed prize pools and more chips added to the players starting stacks. 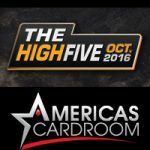 The Mega Stack tournament format gives players a starting stack of 15,000 chips when they register for these tourneys. 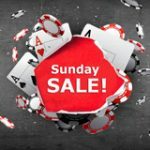 The tournaments offer a wide range of buy-in amounts to suit any poker players budget, there is even a more affordable option to win a tournament coupon through the daily satellite tournaments. 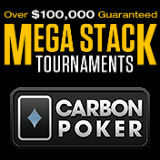 Play the Carbon Poker Mega Stack tournaments. 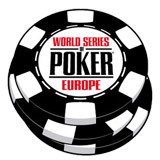 Players can register for the Carbon Poker Mega Stack tournaments in the lobby after downloading the software and signing up for a free poker account.